Because you can never have too many ways to keep things clean, I thought I'd just keep going after posting Part I last week. I can be a little crazy when it comes to Cleaning, so bear with me if this becomes on on-going post. Remember, cleaning is my therapy. Old toothbrushes (and new ones). Once we've retired our toothbrushes, I toss them in the dishwasher as well and they become mini scrubbers that are excellent at cleaning grout and all sorts of nooks and crannies. Old dish clothes. Again... You get the drill by now. I use these to polish and clean. Once I'm done, it's back to the washing machine they go. Ditto for old socks. Stick them on your hand a dust away blinds and other hard to reach surfaces. Magic Erasers. They work miracles everywhere. The before mentioned Rubbing Alcohol and peroxide. Lemon oil for polishing wood. All-purpose - 1 teaspoon dish soap to 4 cups of water. Disinfectant - 1 part rubbing alcohol to 1 part water. I use it straight as well. Test surface before doing this. Glass - 1 part vinegar to 1 part water. Use newspaper instead of a cloth and you won't get streaks. Natural goo gone - 1 park coconut oil to 1 part Baking Soda. More natural cleaning product recipes can be found here. Miscellaneous tips for the crazed cleaner. Lemons and salt work well to scrub the bottoms of pans and the inside of a stainless steel sink. Just mix equal parts together and scrub. To clean a nasty microwave, place a bowl of water inside and turn it on high for 1-2 minutes. The steam will loosen any grime so all you'll need to use is soap and water. 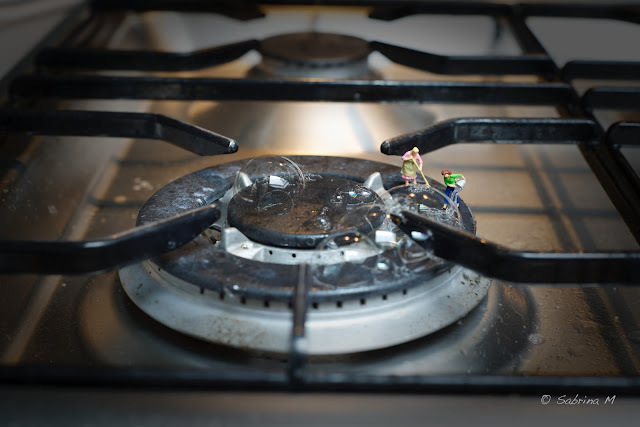 Use baking soda and dish detergent to clean ceramic stove tops. Sprinkle baking soda over the surface then cover it in a detergent soaked cloth. Leave for 30 minutes and then rub the paste into the grime. Wipe down with a clean washcloth and polish with rubbing alcohol. That's really up to you, of course, but to keep things looking clean and feeling clean, I recommend daily, weekly, and monthly and/or seasonal cleaning. If you stay ahead of it, it won't seem like such a big job. I wipe down surfaces daily with soap and water or rubbing alcohol. I dust once a week. I vacuum 2-3 times a week. I wash sheets once a week and towels as needed. I would like to say I wash the windows more often than I do, but this falls into the seasonal category for most windows, otherwise it's once a month. Maybe you'd like to follow this schedule. I can go from casual cleaning to warrior mode in a snap. One time I started to wipe down the front of the refrigerator and two hours later my fridge was deep cleaned inside and out. For me, it's all about keeping the house healthy for me and my family.